The National Museum of Scotland has a unique wing dedicated to the complete history of Scotland. It spans about five floors, moving up a tower from the base of the museum to the top. Many museums present the history of a location with the layout of their exhibits, but none quite so thoroughly as the National Museum of Scotland presents its own country’s history. The bottom floor begins with the formation of continents when the world was young. The land mass that became Scotland actually started in the southern portion of the sea. Slowly, as the Earth’s surface formed, it drifted ever northward where it eventually collided with the rest of the UK landmass, which is why it sports such a rugged landscape. 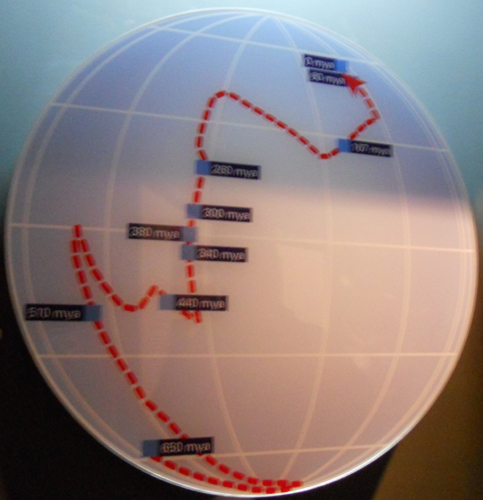 After depicting Scotland’s long journey via a series of globes, the museum displays the ancient landscapes that would have inhabited Scotland, from swamp to forest. Moving deeper into the exhibit, there are many artifacts on display from Scotland’s earliest tribal people, including the weapons they used for hunting and the gems they used for barter. 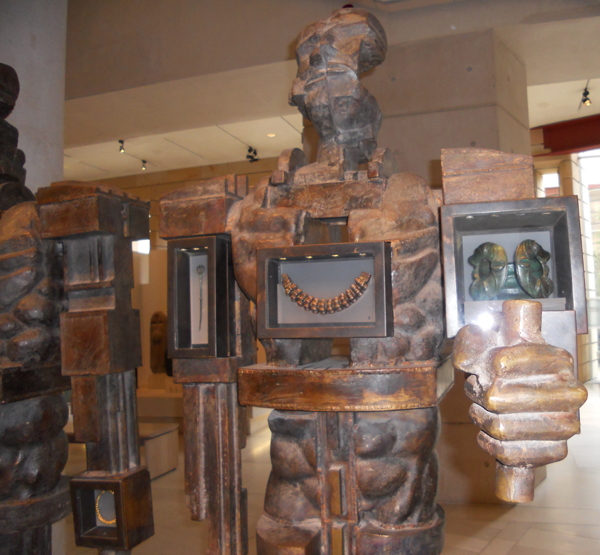 One of the most interesting displays was a series of large stone men, wearing tribal jewelry while they undertook important tasks. 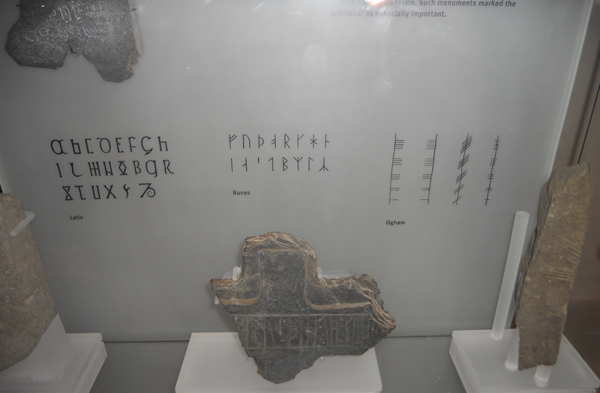 Another interesting display from Scotland’s early history showed examples of the three languages commonly used by ancient Scots (Latin, Runes and Ogham). While Latin was often found on the carvings which decorated churches, most people regarded writing as a form of magic spell. They would copy Runes and Ogham onto objects in hopes of harnessing that magical power. Moving up a floor, a large portion of the display is dedicated to the church and the role it played in medieval Scotland. 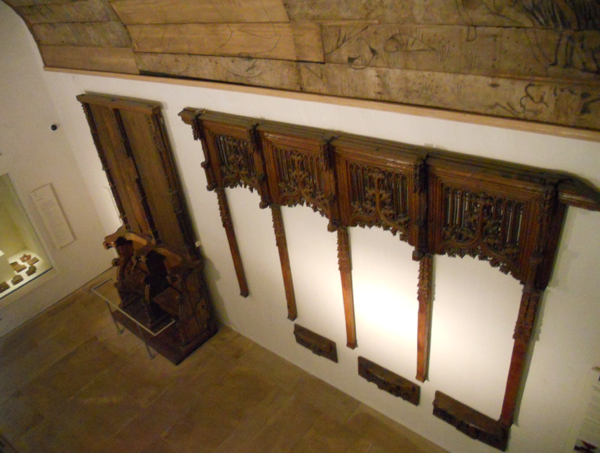 This section contains some truly impressive wood work which would have been found in churches at that time. As is often the case with medieval churches, the display is also filled with gold objects which were used in the church. 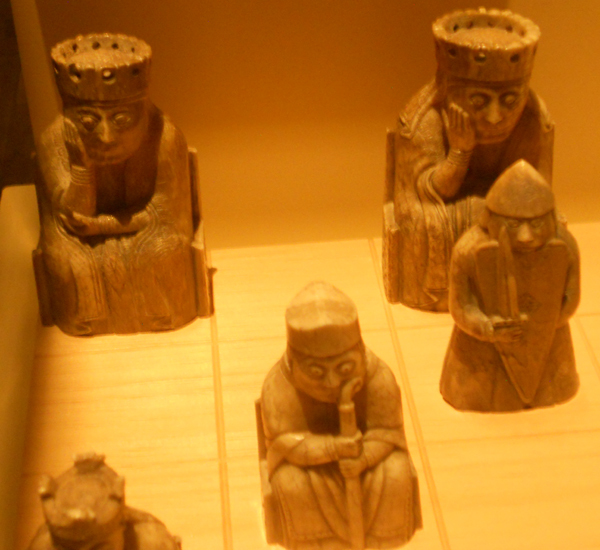 Before we arrived, I set myself the task of locating the remaining Lewis chessmen, the rest of which are on display at the British Museum. 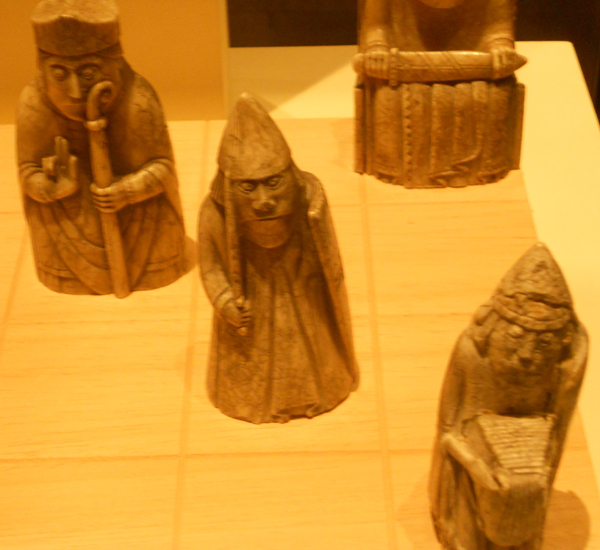 I was able to locate all but one (a bishop which was supposed to be on display in the church section). It may seem a strange thing, since they’re not much different from the ones on display in London, but I wanted to see the whole set. Our time at the museum was limited. We needed to hit the road, as we had many other stops planned. After lingering on the lower floors, we had to move swiftly through the rest of the display. 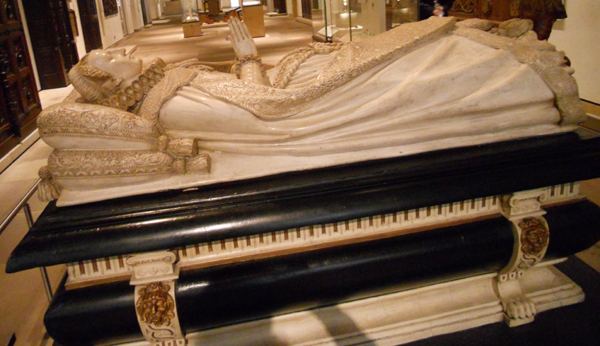 We paused to admire the sarcophagus of Mary, Queen of Scots, which is a truly amazing piece of work, before moving upstairs to the more modern portions of the exhibit. Textiles played an important part in the development of Scotland, especially as countries began to trade internationally. There are many large looms illustrating the evolution of weaving in Scotland throughout the ages. 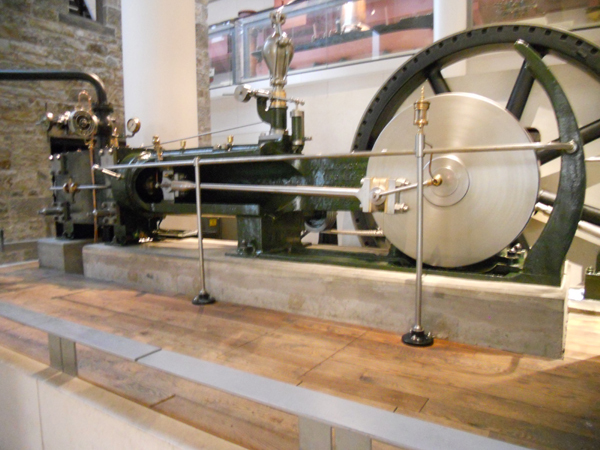 There’s also a large steam engine and several machines which were used for mining. On our way out, we paused to examine the Millennium clock tower, a sculpture made specifically for the National Museum of Scotland. It is meant to depict the tragedies and triumphs of the millennium. It echoes the form of a medieval cathedral, divided into four sections; the crypt, the nave, the belfry and the spire. Among the gears in the crypt are an ancient spirit and a mischievous Egyptian monkey. A pendulum rests in the nave, straddled by the skeletal figure of Death. It also includes distorted figures of Lenin, Hitler and Stalin, to represent the worst aspects of the twentieth century. The belfry holds twelve figures, each representing a calendar month as well as a hardship faced by humanity, such as war, famine or slavery. Atop the spire is the figure of a woman carrying a man, meant to represent compassion. By the time we left, both my husband and I knew we wanted to return to Edinburgh so that we could spend another day exploring the museum.